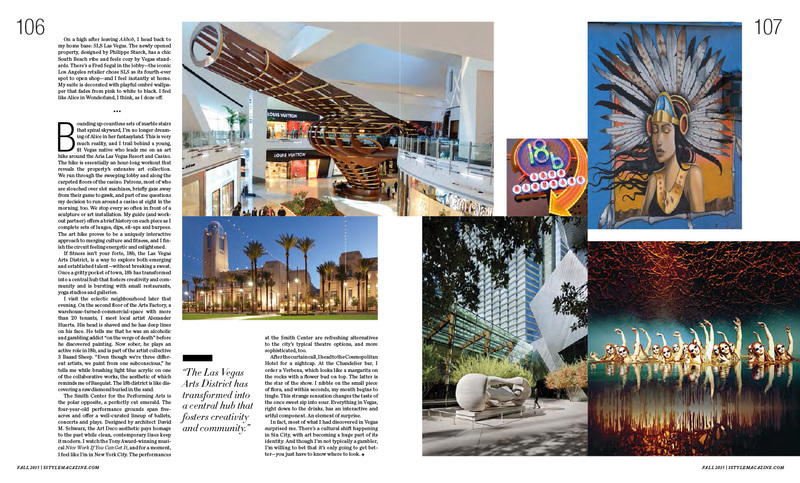 Beyond Las Vegas’ flashy fluorescent lights and the methodical clinking arts and culture scene that is often overlooked. Published in S/ magazine, Fall 2015. Neon pink light illuminates the room I’m standing in. It’s so intense that my eyes are watering. The large, two-room space has curved ceilings and circular openings at either end. There are walls to my left and right, but my depth of field is completely thrown off; I can’t tell if they’re 30 inches or 30 feet away. And I’m not wearing shoes. Instead, white disposable fabric booties, which look like hairnets, cover my feet. I hear a ringing in my ears and the air feels like it’s getting thinner. But it’s not; it’s an illusion. Akhob is an immersive art installation by American artist James Turrell, tucked away on the third floor of the Louis Vuitton boutique at The Shops at Crystals, a luxury retail centre in Las Vegas. 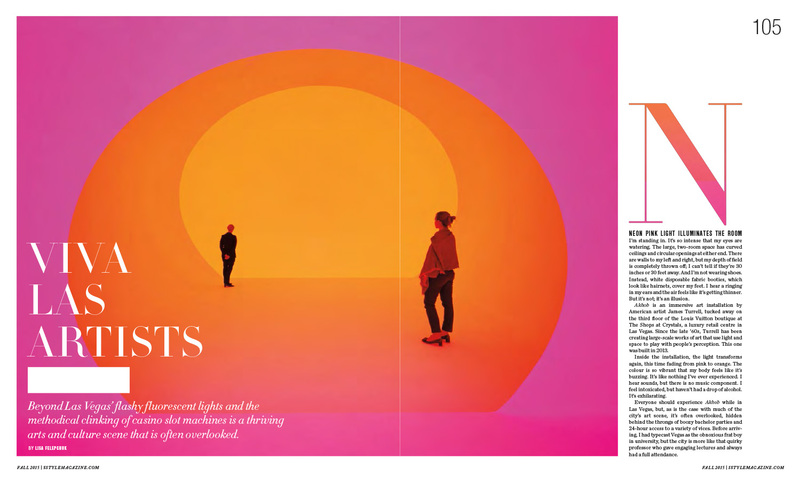 Since the late ’60s, Turrell has been creating large-scale works of art that use light and space to play with people’s perception. This one was built in 2013. Inside the installation, the light transforms again, this time fading from pink to orange. The colour is so vibrant that my body feels like it’s buzzing. It’s like nothing I’ve ever experienced. I hear sounds, but there is no music component. I feel intoxicated, but haven’t had a drop of alcohol. It’s exhilarating. Everyone should experience Akhob while in Las Vegas, but, as is the case with much of the city’s art scene, it’s often overlooked, hidden behind the throngs of boozy bachelor parties and 24-hour access to a variety of vices. Before arriving, I had typecast Vegas as the obnoxious frat boy in university, but the city is more like that quirky professor who gave engaging lectures and always had a full attendance. On a high after leaving Akhob, I head back to my home base: SLS Las Vegas. The newly opened property, designed by Philippe Starck, has a chic South Beach vibe and feels cozy by Vegas standards. There’s a Fred Segal in the lobby—the iconic Los Angeles retailer chose SLS as its fourth-ever spot to open shop—and I feel instantly at home. My suite is decorated with playful ombré wallpaper that fades from pink to white to black. I feel like Alice in Wonderland, I think, as I doze off. Bounding up countless sets of marble stairs that spiral skyward, I’m no longer dreaming of Alice in her fantasyland. This is very much reality, and I trail behind a young, fit Vegas native who leads me on an art hike around the Aria Las Vegas Resort and Casino. The hike is essentially an hour-long workout that reveals the property’s extensive art collection. We run through the sweeping lobby and along the carpeted floors of the casino. Patrons, most of who are slouched over slot machines, briefly gaze away from their game to gawk, and part of me questions my decision to run around a casino at eight in the morning, too. We stop every so often in front of a sculpture or art installation. My guide (and workout partner) offers a brief history on each piece as I complete sets of lunges, dips, sit-ups and burpees. The art hike proves to be a uniquely interactive approach to merging culture and fitness, and I finish the circuit feeling energetic and enlightened. The Smith Center for the Performing Arts is the polar opposite, a perfectly cut emerald. The four-year-old performance grounds span fiveacres and offer a well-curated lineup of ballets, concerts and plays. Designed by architect David M. Schwarz, the Art Deco aesthetic pays homage to the past while clean, contemporary lines keep it modern. I watch the Tony Award-winning musical Nice Work If You Can Get It, and for a moment, I feel like I’m in New York City. The performances at the Smith Center are refreshing alternatives to the city’s typical theatre options, and more sophisticated, too. After the curtain call, I head to the Cosmopolitan Hotel for a nightcap. At the Chandelier bar, I order a Verbena, which looks like a margarita on the rocks with a flower bud on top. The latter is the star of the show. I nibble on the small piece of flora, and within seconds, my mouth begins to tingle. This strange sensation changes the taste of the once sweet sip into sour. 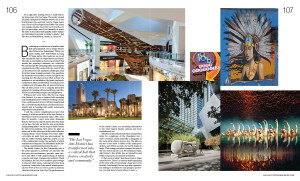 Everything in Vegas, right down to the drinks, has an interactive and artful component. An element of surprise. In fact, most of what I had discovered in Vegas surprised me. There’s a cultural shift happening in Sin City, with art becoming a huge part of its identity. And though I’m not typically a gambler, I’m willing to bet that it’s only going to get better— you just have to know where to look.